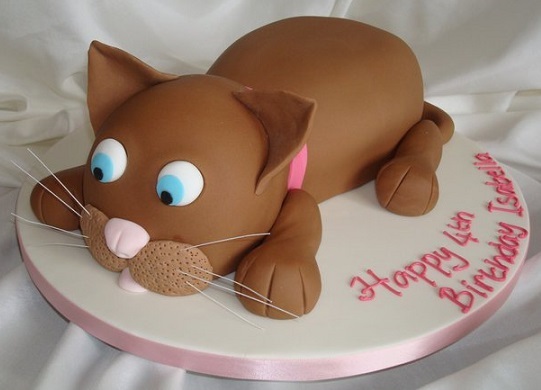 Puddy cat cakes and kitten cakes can make the most fabulous gift or birthday surprise for cat lovers and feline fans. 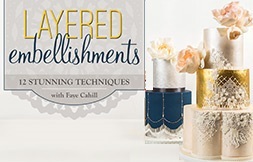 Whether as a cake topper, a shaped cake or a sculpted cat cake, there are endless ways to incorporate “cattiness” into a beautiful cake design. 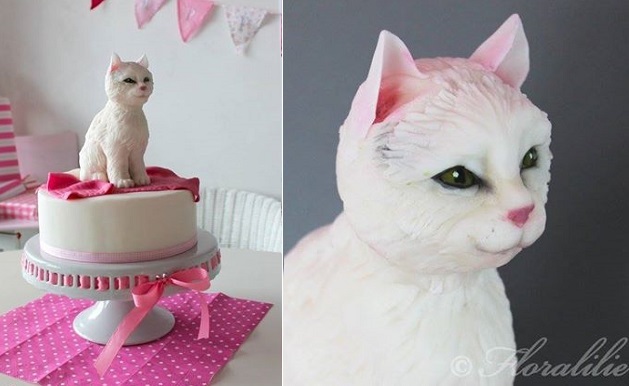 The masterpiece sculpted cat above is the wonderful work of Floralilie Sugar Art creating an almost life-like sugar replica of the birthday girl’s furry friend. 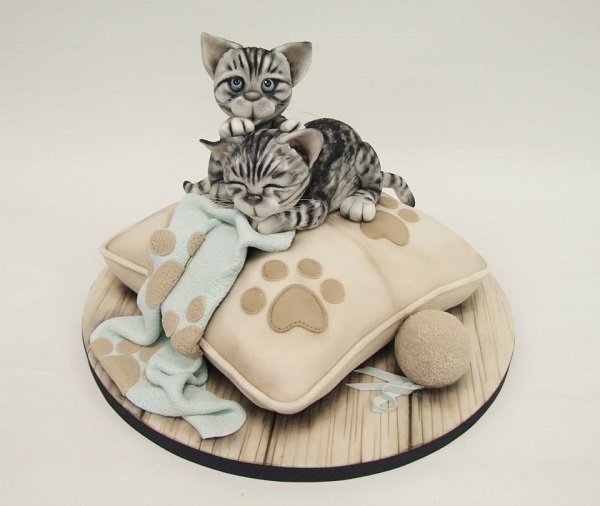 Below, Bolos par Amigos Cake Design, Portugal have designed a wonderful cat surprise cake with beautiful finishing touches. 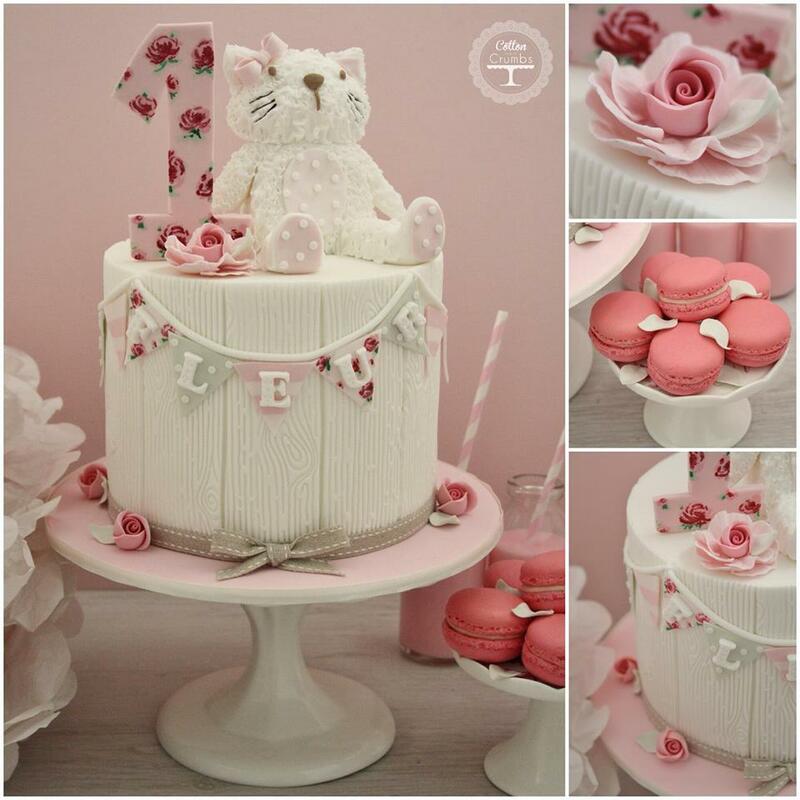 The innocence of a little kitten is captured perfectly in the beautiful cake below by A Cakeful of Character. 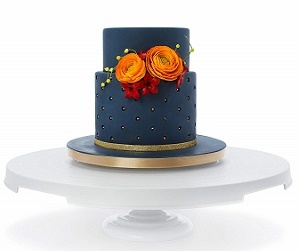 Vintage bunting, florals and wood panelling create a superb party cake below topped by a tatty teddy kitty in a terrific design by Cotton & Crumbs. 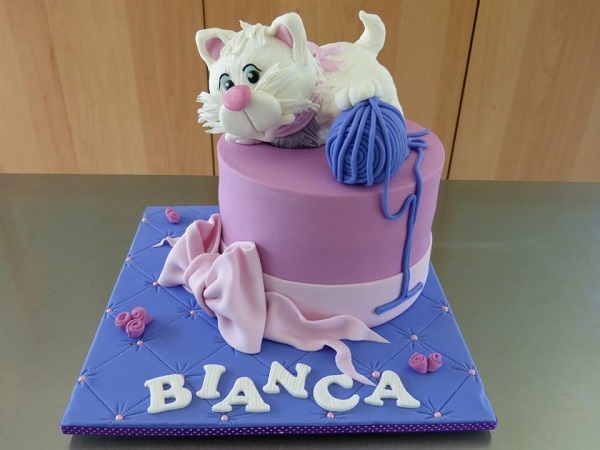 A round and oval shaped cake together with little fondant ears and paws come together in a wonderful cat cake design below by Cakes by Carol. 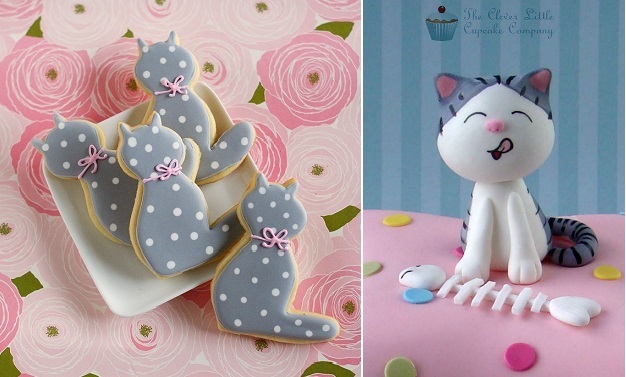 These polka do cat cookies from Bake at 350 make a brilliant party favour for a cat lover’s special occasion. 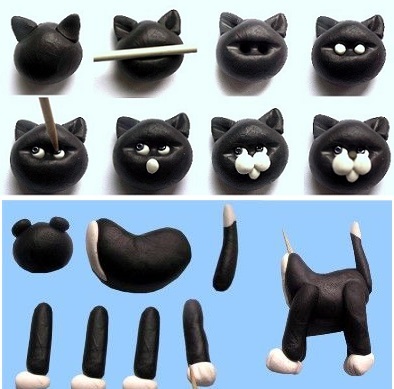 You’ll find all the details here: cat cookies tutorial and recipe. 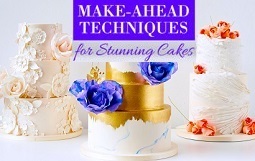 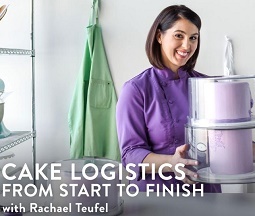 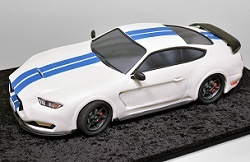 Below right, The Clever Little Cupcake Company have created a brilliantly animated little cat topper brought to life withterrific handpainted detailing. 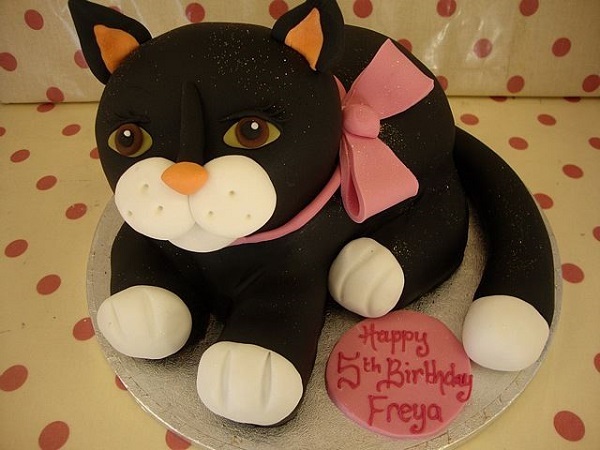 A simple but perfect cat cake design – perfect if you have to whip up a cat cake in a hurry – by One Sweet Girl (via The Little Big Company). 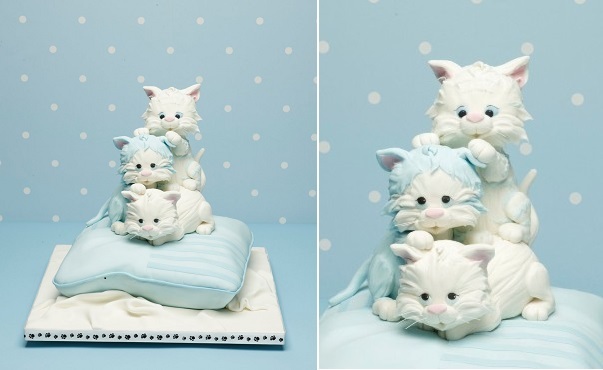 Two more adorable little sugar kittens by leading cake artist, Emma Jayne Cake Design. 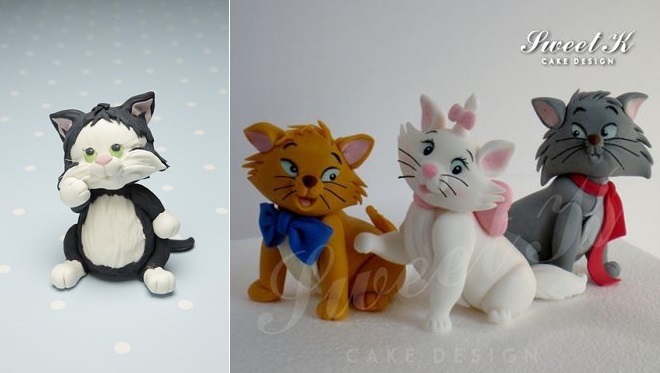 Another of Debbie Brown’s super cute creations (below left) and a whole host of cartoon-style cat characters by sugar modelling star, Sweet K Cake Design (below right). 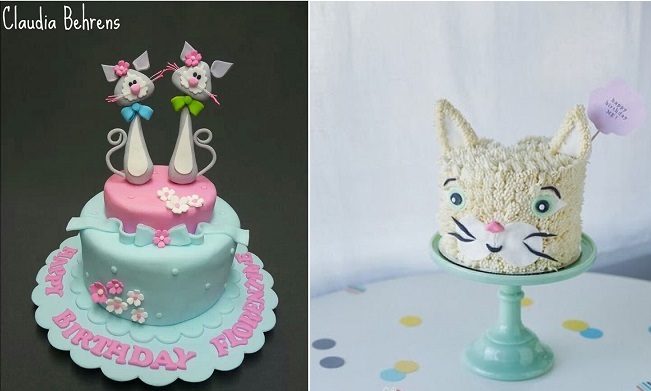 A fabulously whimsical cat cake (below left) in her signature style by Claudia Behrens and on the right, a super simple and superbly effective buttercream cat cake by CoCo Cake Land. 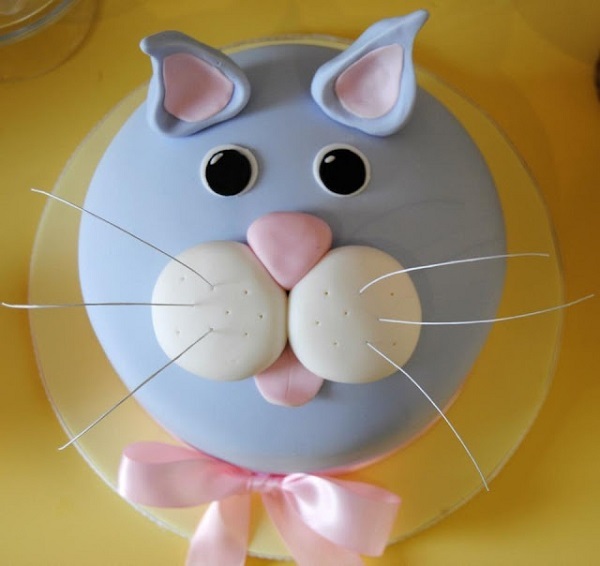 (You’ll find the instuctions here: buttercream cat cake tutorial). 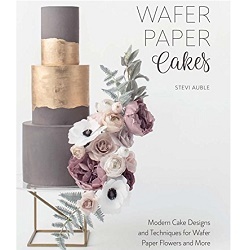 Below, the wonderfully talented Verusca Walker demonstrates how to make a four-legged cat topper. 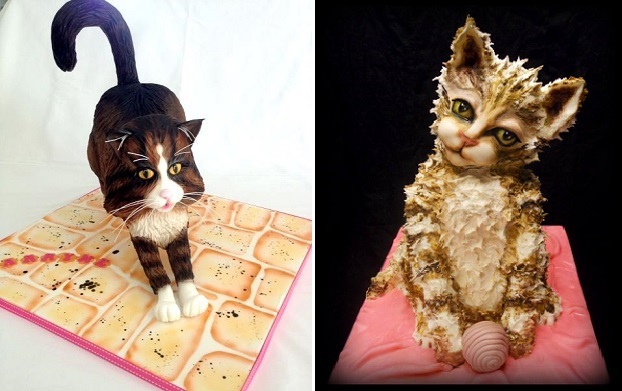 Two more superbly realistic cat cakes feature below – a little kitten by Butterfly Dream Cakes (left) and a masterpiece sculpted cat cake by cake sculpting pros, Richard’s Cakes (right). 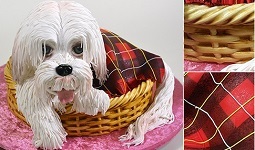 Black Betty’s Lab demonstrate how to create the two moggies below for a cute little couple cake topper. 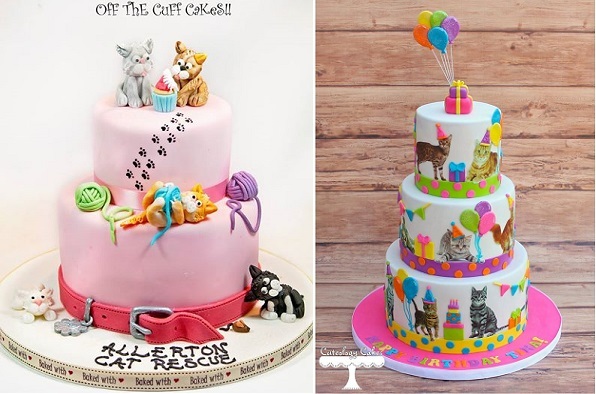 Outstanding sugar art by Eat Cake Party, (left) and Sugar Inspired, (right) in the two amazing cat cake designs below. 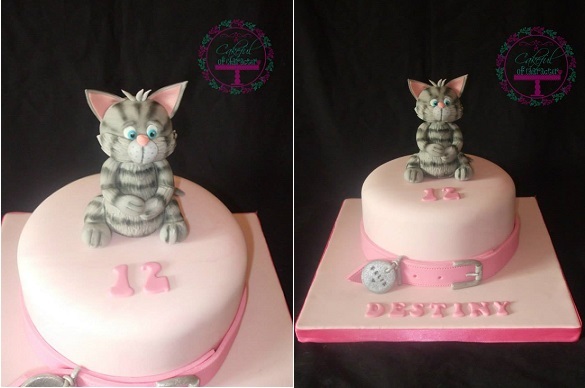 Another signature sculpted cat cake by Richard’s Cakes below. 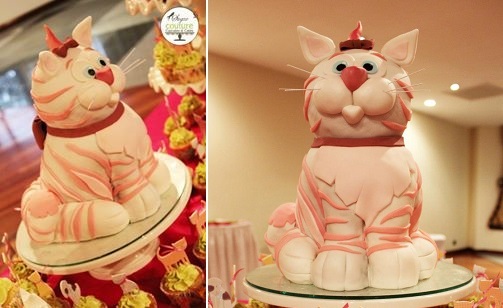 A life-size cartoon cat cake makes a terrific party centrepiece by Sugar Couture Cupcakes & Cakes below. 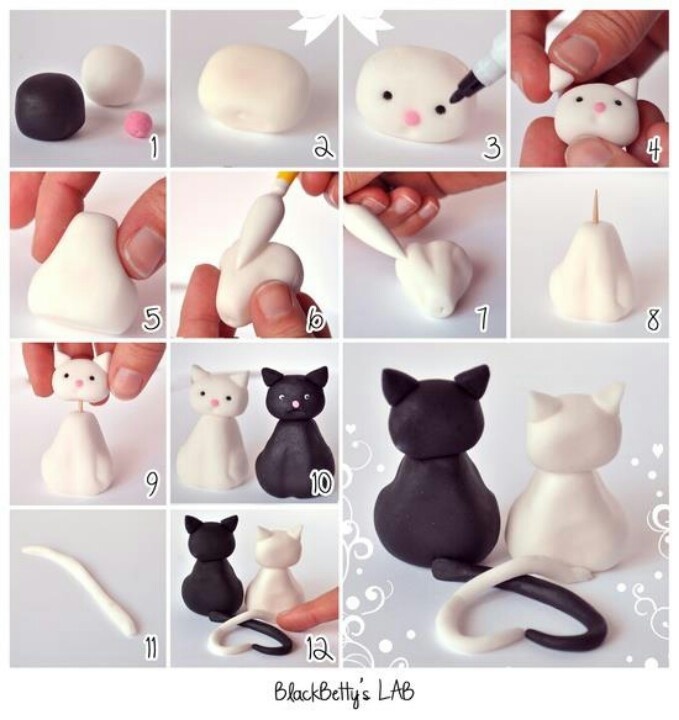 Fabelhafte Zuckerwelt, Austria show you how to make their brilliant cat model (below left) right here: cat topper tutorial. 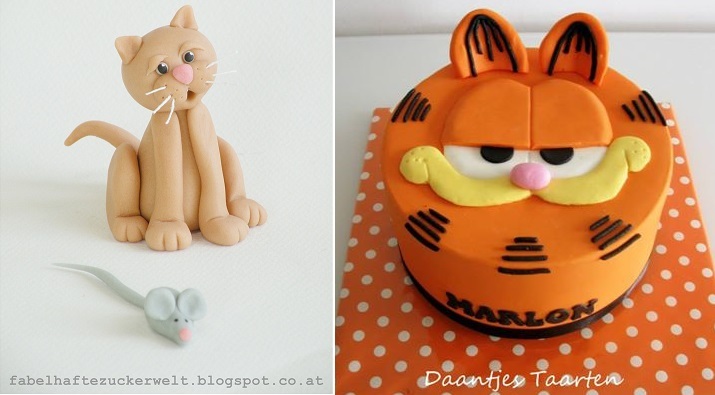 Below right, the coolest cat of all – Garfield – makes a super party cake by Daantjes Taarten, complete with matching polka dot covered board. 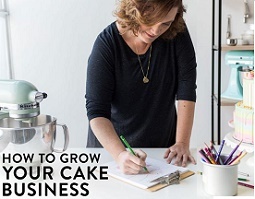 Garfield maybe the coolest cat, but Hello Kitty is the cutest cat, especially in the pretty cake design below by Shereen’s Cakes & Bakes. 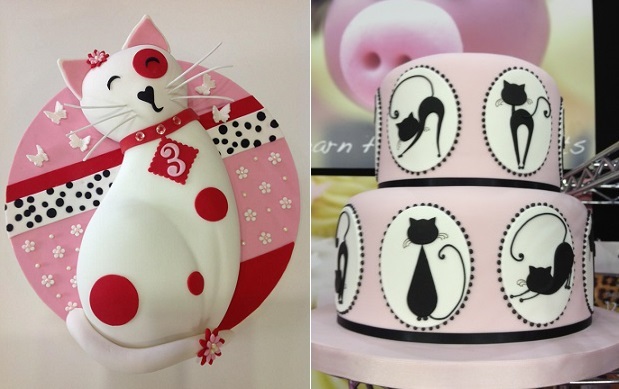 Cat chic is created in cake below in a beautiful cakes by Cakeage (left, inspired by Lindy Smith and Blossombelle Cakes) and a pink and black “sophisti-cat” cake from Cakes For Fun (below right). 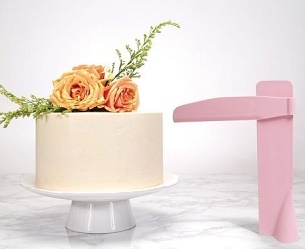 Bright pastels and even neon shades set off the two fabulous tiered cat cakes below by Off The Cuff Cakes (left) and Cuteology Cakes (right). 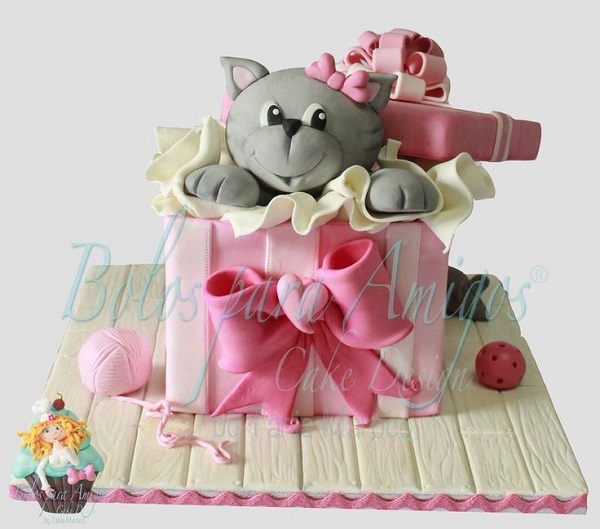 Pink and purple make the purrfect colour combination to showcase this beautiful little kitten cake by Sugar Allure, below. 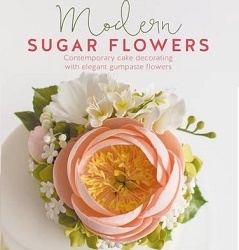 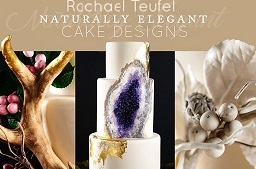 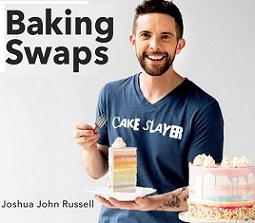 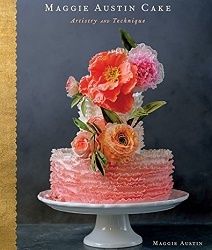 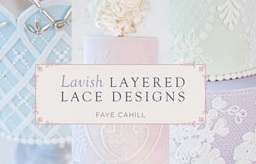 Join the Cake Geek Magazine Facebook Page here for more cake style and design updates. 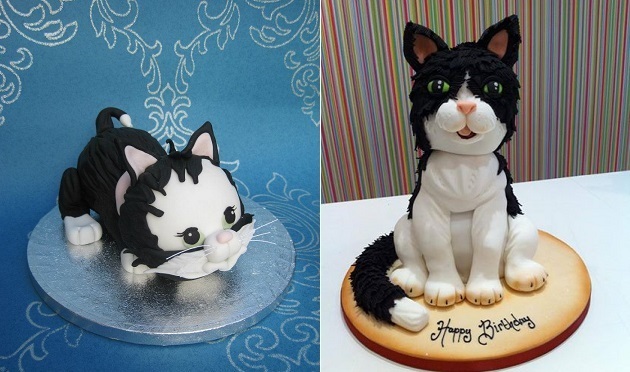 Kitty cat cake toppers are just one of a selection of animals taught in Craftsy’s Animal Cake Topper class below. 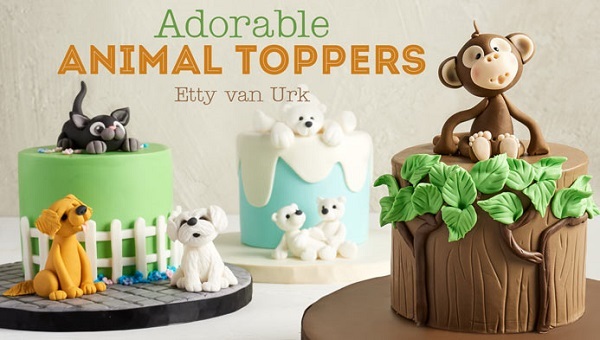 Get all the details here: Adorable Animal Toppers.